The latest issue of Saveur has an article on the Korean obsession with kimchi... and "obsession" might not be a strong enough descriptor, being that they have a kimchi museum... but for an ignorant American, it was quite surprising how many varieties there are. We have an excellent Korean restaurant around the corner from us, so it's not that I'm unfamiliar with the cabbage kimchi pictured above... but I had never heard of "water kimchi" for example. 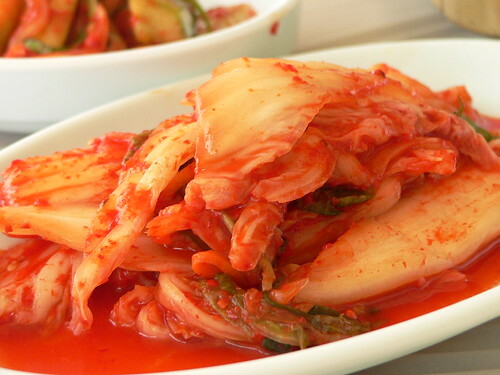 Another surprise is that traditional kimchi isn't vegetarian. So while I think I'm going to order a 6 quart glass jar and make a trip to Super 88 for ingredients... we'll have to omit the anchovy sauce and salted shrimp from the Saveur recipe. There is such a thing as vegetarian fish sauce, so maybe we'll substitute that for the anchovy sauce at least. Hmmm... the list of things I'm planning to cook is getting long... I better do some actual cooking soon. Though I guess you could argue pickling isn't cooking... mostly just waiting around, which even I can handle (I hope). They get a Pickle Day! ?